This is my 2nd mini painted.... The flash makes him a lot brighter than in person, so keep it in mind... C+C appreciated!!! Very nice. I still can&#39;t believe that that&#39;s your only your second mini!! Hope so see more of your stuff on the site. Bull dude! That cannot be your second painted model! It&#39;s just far too good! Very nice. My only concern is the skin, but as you said it was the flash... To be honest though the only thing that ruins that model is the stupid big nose grot in the back! Nice. 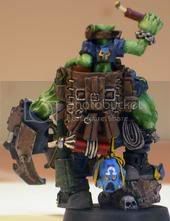 Hard to believe it is your 2nd mini ever, or did you mean ork? I&#39;ve been painting almost 4 years, and that&#39;s better than my best model. You&#39;ve got great skills coming on Four!